Turkey's President Recep Tayyip Erdoğan meets with Moldova's Prime Minister Pavel Filip. Photo Credit: Moldova PM Office. During the past few weeks, subtle events took place in the Republic of Moldova, which largely flew under the international media’s radar amidst rising tensions between Turkey and Saudi Arabia. Despite the standoff between the two over the death of Jamal Khashoggi, Turkish President Recep Tayyip Erdoğan still found time to make a two-day diplomatic visit to the Republic of Moldova, between October 17-18. Whilst on this visit, Turkey and Moldova signed several economic agreements. However, the importance of Erdoğan’s visit goes beyond economic ties and may potentially foreshadow the political course the country will take in the years ahead. Even though Moldova is a small and impoverished country, it has become a political battleground between pro-European and pro-Russian supporters. Indeed, there are few nations in Europe with such polarising geopolitical views as Moldova. Whilst European Union flags drape from practically every governmental building, Russian influences, including the media, still predominate in Moldova. The split in the republic is best represented by the fact that the ruling parliamentary party, the Democratic Party of Moldova, is nominally pro-European, whilst the president, Igor Dodon, is pro-Russian. This difference of opinion, has led to several clashes between the president and parliament. However, recently Moldova has been shunned by the two geopolitical powers that it’s population aspires for closer integration with. After signing a European Union Association Agreement in 2014, Russia moved to ban a number of imports from Moldova, including wine and agricultural produce, which had a harsh effect on the economy. Furthering its diplomatic isolation, Moldova has recently come under fire from the European Union, who are concerned about the preservation of democratic standards in the republic, as well as Moldova’s failure to implement the commitments it made in 2014. This has led to some in Brussels to call upon the European Union to halt its funding to Moldova, at least until after the 2019 elections. Hence, Erdoğan’s visit to Moldova occurred amidst diplomatic uncertainty, spurred by internal disputes and external pressures. By visiting during such turbulent times, Turkey has positioned itself not only as a new regional partner to Moldova, but as a potential counter balance to both Russia and the European Union. Should the European Union cut off funding, Turkey has proved willing to fund various Moldovan projects. In addition to this, new measures signed between the two countries during Erdoğan’s visit will make trade easier, potentially mitigating some of the damage caused by the loss of Russian markets. Whilst Turkey could never provide the same funding as the European Union, import as much agricultural produce as Russia, or receive the political support that the two geopolitical powers enjoy in Moldova, support from Ankara could allow the ruling elites, most notably oligarch Vladimir Plahotniuc, breathing space as they clarify their position, and consolidate their power in the run up to the 2019 elections and beyond. This last point is of particular relevance to Moldova. Recently, the Moldovan authorities announced that the results of the mayoral elections in Chișinău were to be annulled, after victor and rival of Plahotniuc, Andrei Năstase, was elected mayor. Both the Appellate Court and later the Supreme Court alleged that Năstase and his opponent Ion Ceban had campaigned on social media on election day. This move has caused concern amongst many Western commentators for the preservation of democratic standards in Moldova. Should Moldova, as many Western commentators believe, move away from democracy, then it is likely that the elites will find support and inspiration in Turkey. Indeed, Moldova has been cultivating closer ties with Turkey for the past while, with Plahotniuc even visiting Turkey and meeting with Erdoğan, despite holding no official state position. Despite not being as influential in Moldova as the European Union or Russia, Turkey does hold a significant amount of influence over the country, through its support for the Gagauz population, a Christian Turkic minority who reside in the south of the country. After a failed attempt at secession from Moldova, the central powers in Chișinău granted the Gagauz their own autonomous region . Despite receiving praise from certain Western academics, especially when comparing the lack of autonomy given to other ethnic groups in Eastern Europe, Turkey has recently questioned this autonomy. Indeed, the new Moldovan-Turkish relationship is far from one sided. Standing in front of a crowd in Comrat, the capital city of the autonomous region, Erdoğan told listeners that he, the central authorities and the regional ones had agreed upon concrete steps to implement their autonomy. Thus, demonstrating that he would take care of his ‘kinsmen’. Such declarations should help improve Erdoğan’s standing at home as he battles an economic crisis and looks to re-establish Turkey on the world stage. Attempting to divert attention away from domestic issues, Erdoğan has invaded Syria and is now seeking to position himself as the protector of co-ethnics abroad (a move which has worked well for Vladimir Putin). Successful offensives combined with safeguarding the rights of venerable ‘kinsmen’, is likely to boost Erdoğan’s image at home. 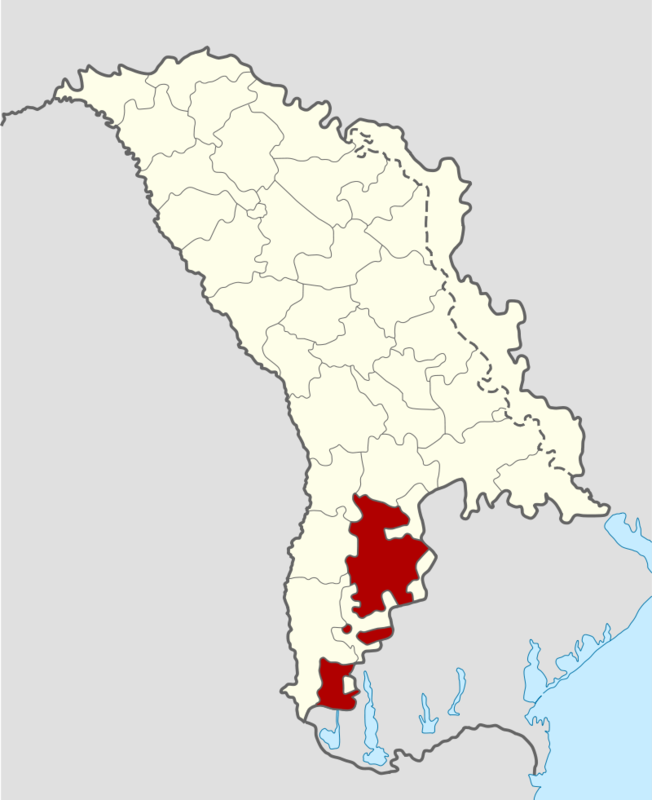 Autonomous Territorial Unit of Gagauzia, Moldova. Credit: Wikipedia Commons. The Moldovan authorities have been more than supportive of closer links with Turkey, which go beyond economics, as evidenced by the deportation of seven Turkish teachers, who reportedly had links to US-based Muslim cleric Fethullah Gulen, who Erdoğan accuses of orchestrating the failed 2016 coup. For now, we can only speculate on how strong the ties between Turkey and Moldova will develop. However, the European Union should take considerable interest in the developments in Moldova. Further disregard for democratic practices could result in further destabilisation of an already poor and fragmented country. Such a situation is not one which the European Union wants on its borders. Furthermore, should Moldova continue to move away from democracy, it is likely that the country will be drawn back into the Russian camp. For the moment, questions surrounding the preservation of democratic standards are just speculative. However, what is certain, is that should Moldova slide towards authoritarianism following the 2019 elections, the establishment of closer ties with Turkey, and Erdoğan’s visit, will be viewed by commentators and historians as a watershed moment in the small nations retreat from democracy. *Keith Harrington, NUI Travelling Scholar in Humanities and Social Sciences,PhD Candidate, History Department, Centre for European and Eurasian Studies, Maynooth University.